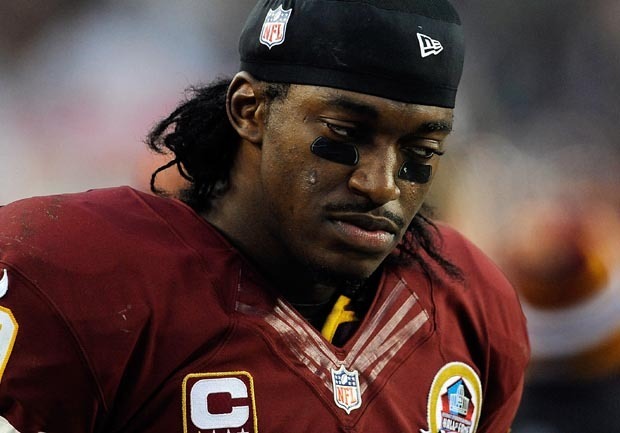 ASHBURN, Va. Get ready for another week of RG3 guesswork. Coach Mike Shanahan said Monday that he's still waiting for a thumbs-up from the doctors before declaring that Robert Griffin III can return to game action. The rookie quarterback sprained the lateral collateral ligament his right knee in last week's win over the Baltimore Ravens and missed Sunday's 38-21 victory over the Cleveland Browns. "We're going to play Robert when he's 100 percent," Shanahan said. "When that ligament's fine, when the doctors feel there's no chance for injury that he can go out there and perform at that level in a game situation without injury, we're going to go with our starter." The sprain was mild, and Griffin made a case for staying in the lineup when he moved well in practice late last week. Shanahan waited until Saturday night to announce that backup Kirk Cousins would make the start and said he taking the doctors' advice. Griffin immediately made it known that he was unhappy with the decision. Fellow rookie Cousins performed well in his first NFL start, completing 26 of 37 passes for 329 yards with two touchdowns and one interception. The win moved the Redskins (8-6) into a three-way tie for first in the NFC East ahead of this week's game against the Philadelphia Eagles. Despite the solid effort, Shanahan ruled out giving Cousins another start just to give Griffin extra time to rest the knee. "If the doctor gives his OK," Shanahan said, "he's going to play."